New Balance’s marketing pitch: Premium stability and superb cushioning without sacrificing style. Upper: Engineered mesh, fused and stitched-on synthetic. Midsole: Tri-density foam stack with a firmer medial post and ‘Fuel Cell’ layer. 8 mm heel drop. This isn't the 1260 you once knew. It has a large medial post but packs a softer ride due to the midsole and outsole changes. The upper has a shallow toe-box and a snug forefoot. Assembled in the USA. 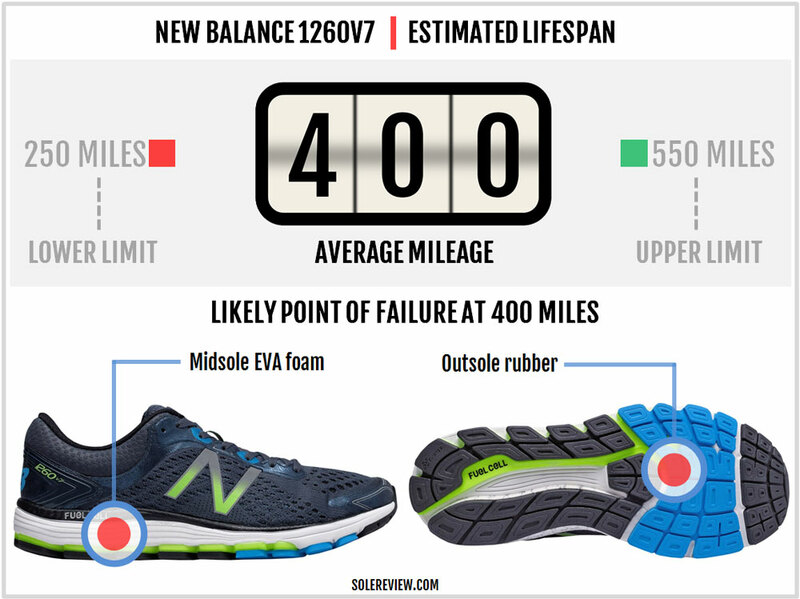 Vast improvements have been made to the formulation of running shoe midsoles. As a result, even neutral shoes can be very supportive and resist midsole deformation in the long term. Our naivete had us believe that supportive neutral shoes will make medially-posted running shoes redundant. It’s never that simple. 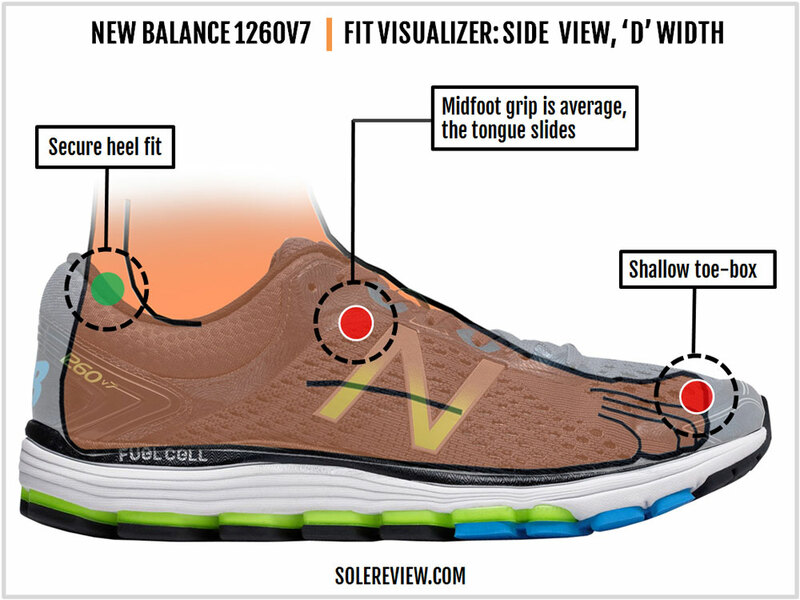 The ‘sensory profile’ of a shoe matters as much as the latter’s real-world functionality. A neutral shoe might be supportive enough, but a large population of runners simply like the sensation of a midsole with a hard medial post. As a result, even in today’s category-neutral era, traditional stability shoes continue to do brisk business. Asics, Saucony, and New Balance have a respectable offering of medially-posted shoes. Brooks used to be on this list until a couple of years ago but they’ve recently watered down their stability assortment. Look no further than the Transcend and Ravenna for proof. As with any running shoe category, stability shoes are available at different prices, cushioning, and support tiers. 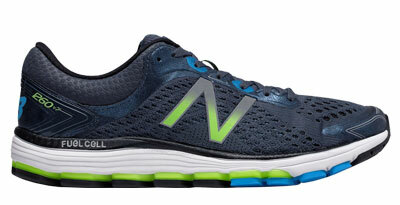 In New Balance’s case, you have the mid-priced 860 V8 with its mild-support character. The 1260 V7 is a plusher version of the 860, using a higher grade of upper and sole materials. As the ‘bigger brother,’ the 1260 is meant to be more supportive than the 860. 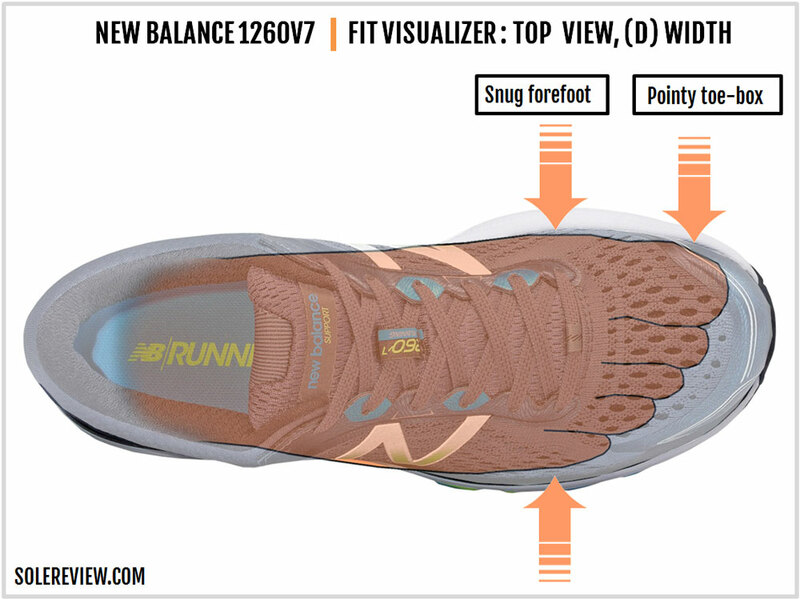 The new 1260V7 is completely redesigned from the sole up. Besides a brand new upper, the midsole gets a ‘Fuel Cell’ insert and redesigned outsole. The Fuel Cell is a layer of rubberized foam placed between the midsole and the outsole which is intended to increase responsiveness. The Fuel Cell insert replaces the ‘N2’ embed last seen on the 1260 V6. The outsole is split into longitudinal halves under the rearfoot, and the plastic ‘T-Beam’ shank is now replaced by foam and rubber. Add to this a softer midsole foam, and you have a 1260 which feels softer but less supportive than its previous version. The large medial post stays, but then again, it’s always the sum of parts that matter. The upper trades external overlays for internal support bands. Though this makes the shoe appear cleaner from the outside, the forefoot fit turns narrower. Also, the toe bumper redesign makes the front shallower than the 1260 V6. So you have a softer and narrower fitting 1260. These changes might be good or bad depending on who’s asking. All the same, just keep in mind that the 1260 isn’t as supportive as it once was. In fact, the lower-priced 860 feels more supportive than the 1260. For those who want to know – the 1260V7 is assembled in the USA. Like most of the running shoes these days, the 1260 uses an engineered mesh upper reinforced with external and internal layers. The toe-box has a fused bumper with aesthetic detailing. A similar material is used for the lacing eyestay as well. The 1260 V6 had outer overlays on the midfoot and the forefoot. The V7 has a cleaner profile and opts for a pair of fused (and reflective) logos over the midfoot. The non-vented section of the engineered mesh does not provide enough structure, so the V7 uses internal bands. The midfoot has a lining to cover the bumps which would have otherwise resulted from the layers. The tongue is soft and foam padded but lacks a sleeve. The laces are a flat kind with a bit of stretch. New Balance uses an ‘Asym’ heel counter. Short for asymmetrical, the internal stiffener is higher on the inner side than it is on the outside. This is designed to increase support on the medial side. Being a stability shoe, the 1260 has a hard foam wedge over the inner midsole. The medial post appears larger than the 1260 V6 because the new midsole does not have the plastic ‘T-beam’ shank. As a result, the medial post extends all the way to the outsole edge and makes it look larger. The highlight of the new 1260 midsole is the ‘Fuel Cell’ insert, a layer of rubberized foam placed between the outer midsole and the outsole. This replaces the ‘N2’ cushioning system of the V6. 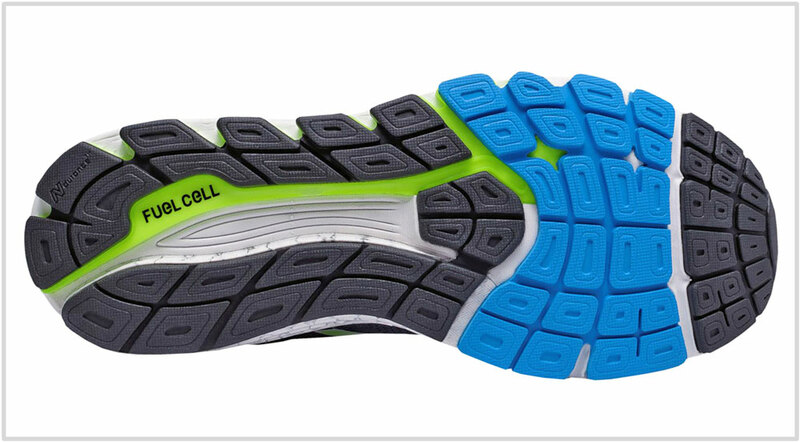 The ‘Fuel Cell’ is closer to the ground than the N2; the latter was placed above the midsole instead of below it. With the T-beam shank gone, the outsole now extends unbroken through the midfoot. The layout is overhauled as well. The outsole under the mid and rearfoot is now split into two by a wide transition groove. The forefoot outsole is made of soft blown rubber while the rear has a harder ‘Ndurance’ carbon rubber. The removable insole is a blown foam type, and the lasting below it is another layer of foam. This is a $150 premium stability shoe so there’s no evidence of cost-cutting. The upper mesh is lined and durable, and the multi-density midsole has a satisfactory lifespan. Just expect normal wear and tear like the gradual shredding of the outsole rubber and the flattening of the EVA foam midsole. The Fuel Cell is durable, but it is only confined to a thin layer near the bottom. The heel grip of the 1260V7 has improved over the V6. The plush collar is comfortable, and the narrower molding improves the heel grip. The sleeve-less tongue slides a lot. The extent of the slide will depend on the foot type. If your foot has a high instep curve, a crazy amount of tongue slide will occur. Else, you can expect a moderate amount of slide. The tongue has a lace-loop but it does not help arrest the movement. The interior midfoot is extremely smooth, and we’re not sure whether this is a good thing. To insulate the foot from the upper layering, a separate fabric lines the midfoot. This makes the insides very slippery, especially when you’re trying to run fast. The 1260 V7 moves most of the outer layering closer to the foot. These support structures are sandwiched between the engineered mesh and the inner lining. 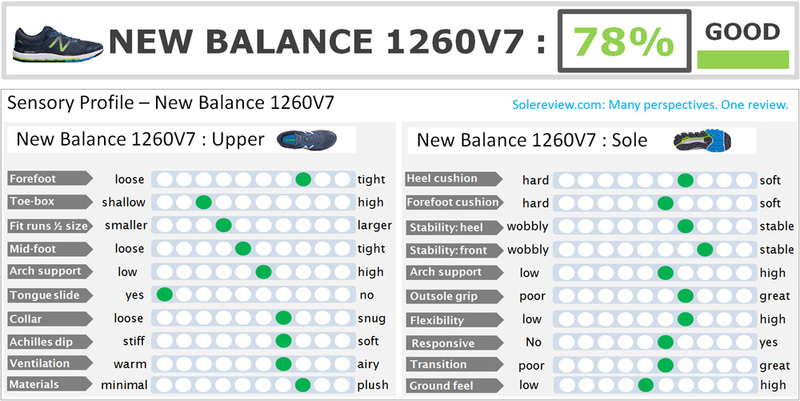 This update affects the V7’s fit quality; the forefoot is narrower fitting than the V6. If there’s any consolation, it’s that the engineered mesh forefoot breathes well and has a soft hand feel. Redesigning the bumper reduces the toe-box height. The new overlay sits shallower and extends longer on either side. This makes the front shallow and pointy. Though this feels like a case for buying a half size up, we advise that you refrain from doing so. Instead, get a larger width. 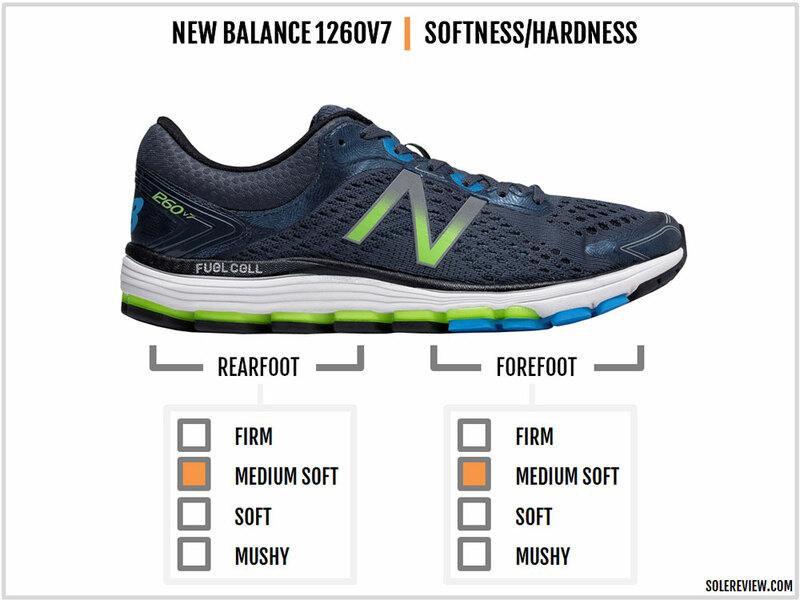 After all, the New Balance 1260 V7 is available in four widths. 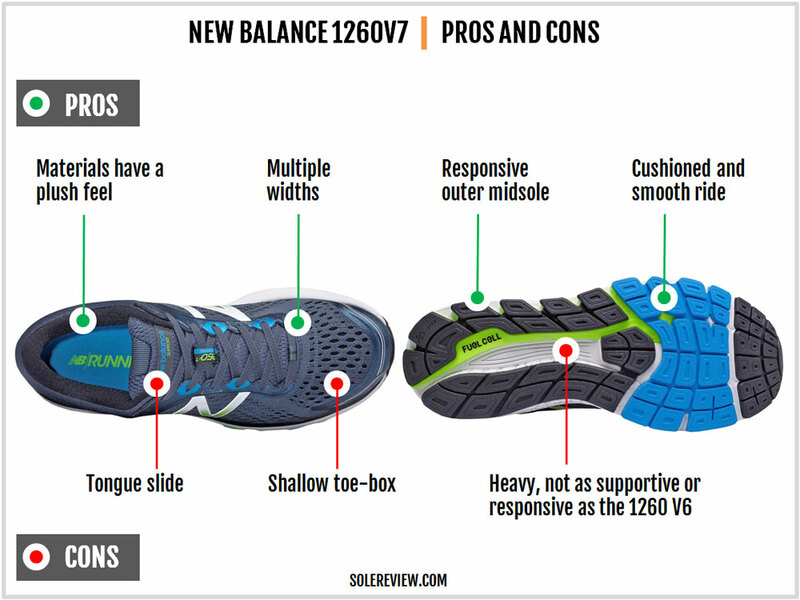 To sum up, the 1260 V7 has a narrow forefoot and a shallow toe-box. 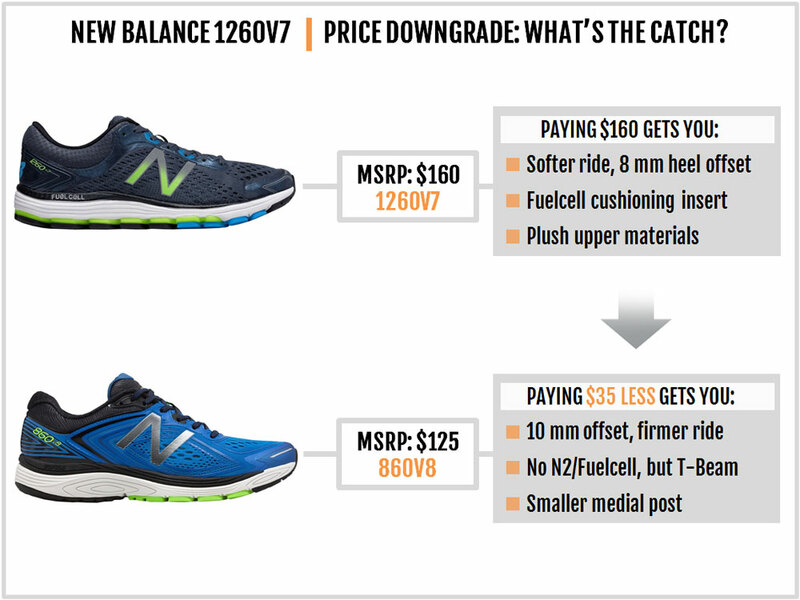 Runners who’re planning to upgrade from the 1260 V6, caveat emptor. The 1260 V7 is softer than the V6. That’s due to the softer midsole foam and the wide groove which splits the outsole into halves. Eliminating the T-beam also decreases torsional rigidity and adds softness. With the 1260, there’s a distinct sensation of the midsole being demarcated into a softer and firmer side. The large medial post makes the inner midsole noticeable firm. The outer midsole with the Fuel Cell insert is much softer. Because of the wide outsole groove, the midsole has a split personality instead of being cohesive. In comparison, the 1260 V6 felt more ‘whole’ because there was no wide groove dividing the rearfoot. Predictably, the softer 1260 V7 doesn’t feel as supportive as the V6. Sure, you feel the medial post providing inner side support. At the same time, the rearfoot doesn’t feel as solid as it did once. The bright side is a slightly smoother transition quality. The outsole fills the gap where the T-Beam shank once used to be, and this helps with transitions. 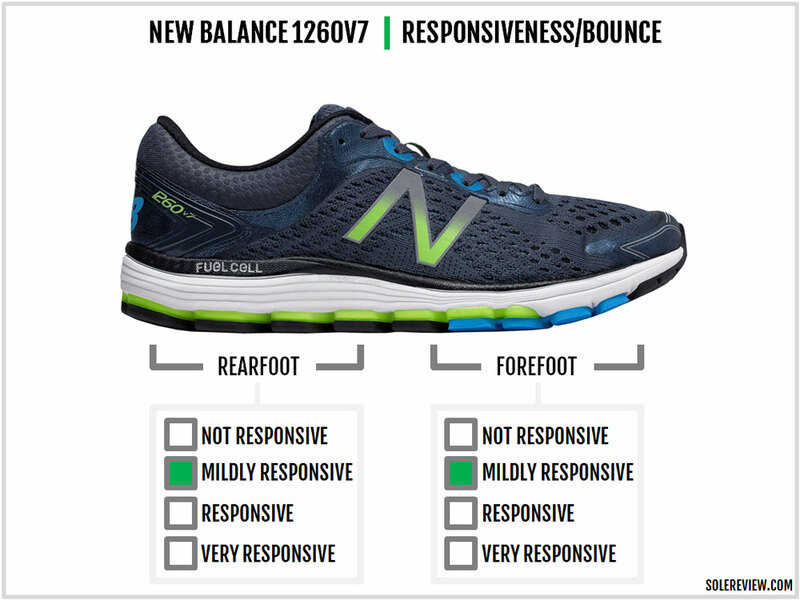 The responsiveness is skewed towards the outer midsole, both under the rear and forefoot. The V6 had an N2 insert placed centrally under the heel and forefoot. In contrast, the Fuel Cell is limited only to the lateral side. Hence the spread of responsiveness is biased towards a single side, and the overall sense of rebound is lower than the V6. Given the overall cushioned nature, the 1260 V7 works as a daily trainer and for long races. There are a few things going for the 1260. The ride is cushioned and partially responsive along with smooth transitions. The blown rubber outsole grips well, and the upper utilizes plush materials to result in a comfortable interior. 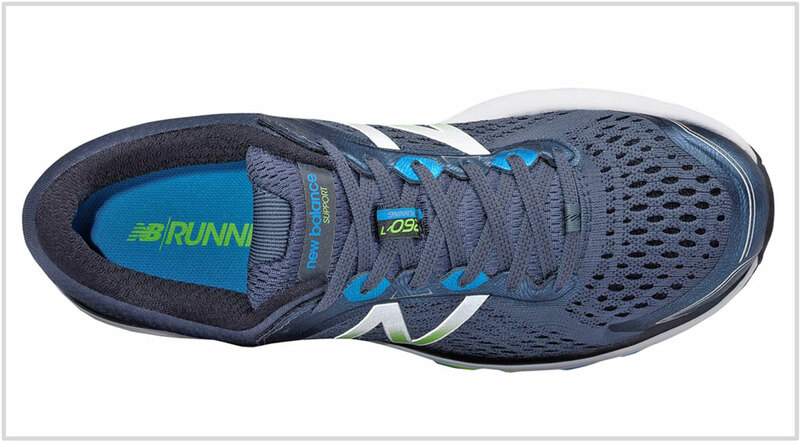 The 1260 is available in four widths which is great for runners who want a customized fit. 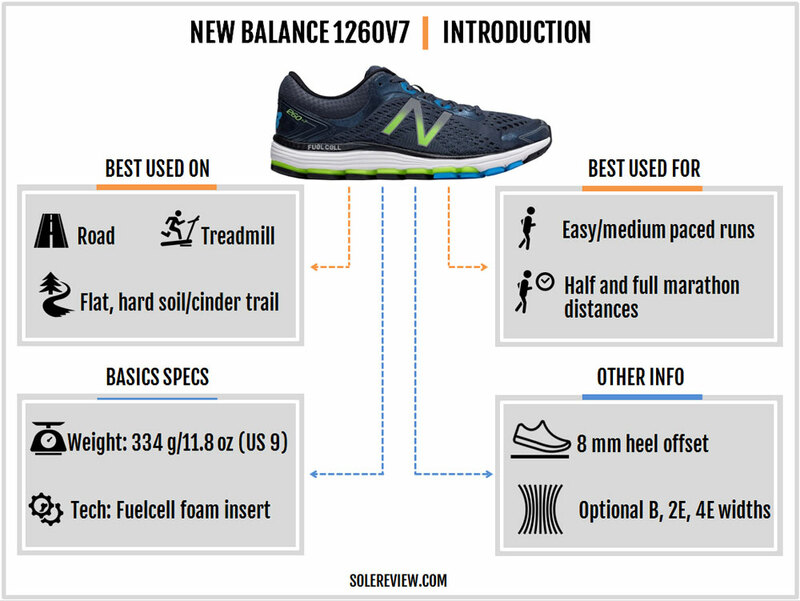 On the negative side, the (near) 12-ounce weight makes the 1260 a heavy shoe to run. Due to the lack of an inner sleeve, the tongue moves around a lot. And lastly, watch out for the deceptively shallow toe-box and the narrow forefoot. It feels weird typing this, but we’ll say it anyway. The lower-priced 860 V8 feels more supportive than the 1260. That’s because the 860 still has the older outsole design along with the plastic T-Beam shank. This increases the torsional solidity of the 860. In comparison, the 1260 is softer and feels less balanced due to the softer midsole and the grooved outsole. The $25 cheaper 860 has a 10 mm heel to toe offset, vs. 8 mm of the 1260. With the 1260, your requirement for a running shoe with a large medial post is covered. 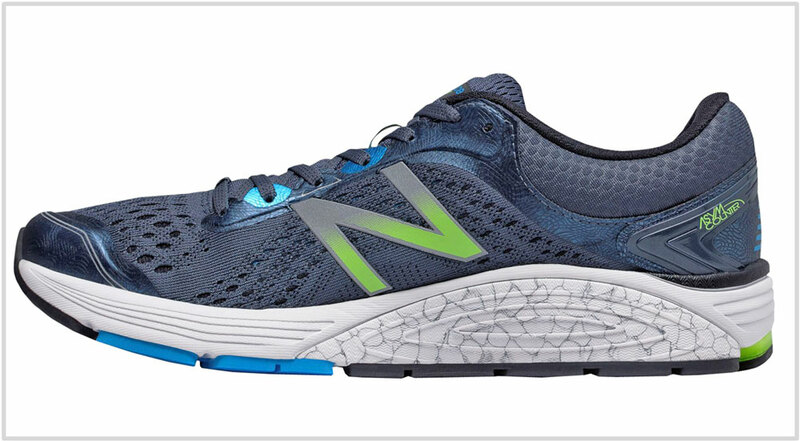 You can consider a mild-support shoe like the New Balance Vongo 2 or the Nike Span 2 as your second rotational shoe. Both the New Balance 1500 V3 and the Asics DS-Trainer 22 are excellent third-shoe choices if you need something fast. If you feel that the Nike Span 2 and the DS-Trainer are a bit of an overlap, you can buy the lighter Asics DS Racer 11 instead. 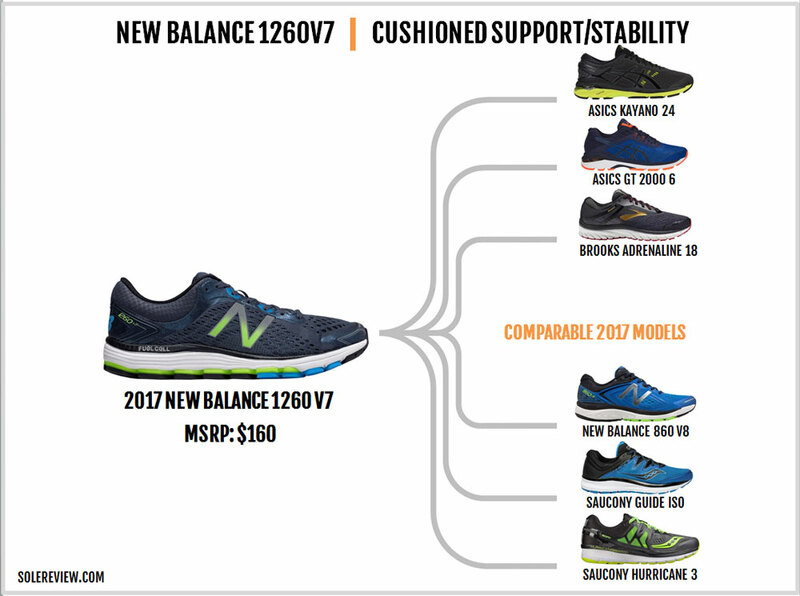 Some brands have exited the traditional stability category in this price tier, so this list also includes lower-priced shoes. 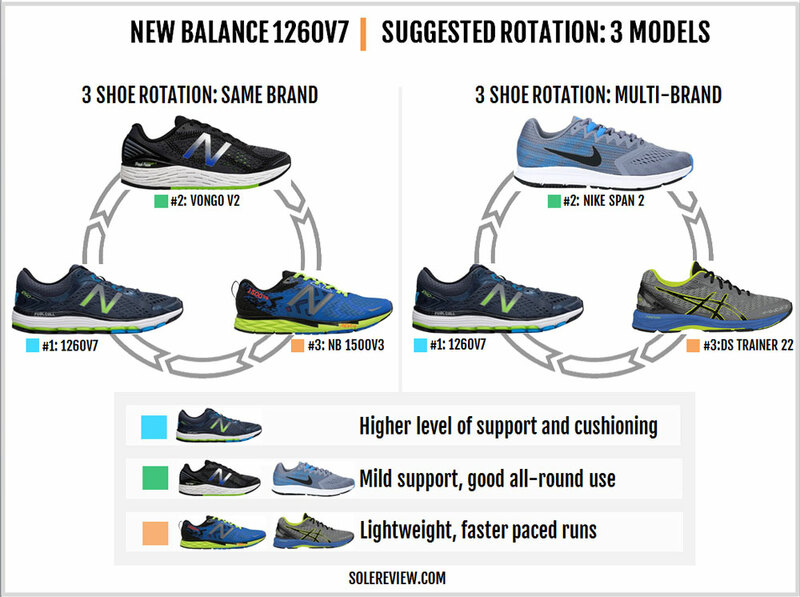 The 860 V8 from New Balance with its firm-ish ride is comparable, and so are the Asics GT-2000 6, Brooks Adrenaline GTS 18, and the Saucony Guide ISO. All these shoes are built traditionally, meaning that the midsole has a harder medial post for added stability. The Asics Kayano 24 compares with the 1260 on price, albeit with a different (firmer) ride quality. The Hurricane ISO 3 is another shoe which offers a cushioned ride with a medial post. The Hurricane ISO 4 is also out now; the ride is much softer due to the full-length Everun midsole. We haven’t included shoes such as the adidas Supernova ST or the Brooks Transcend because they lack a medial post. Besides, the Supernova ST is way softer than all the shoes on this list.